Save money by buying refurbished Dell PERC controllers and adapters from Bargain Hardware - we have some of the cheapest prices anywhere. Dell PERC PCIe RAID controllers offer some of the highest specifications in the business, and support all RAID levels. Dell’s proprietary PERC fault management suite software also enables bad sector management. 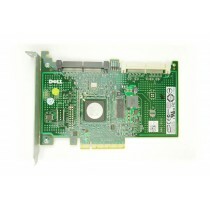 We also stock refurbished Dell Fibre Channel Host Bus Adapters. The Dell PowerEdge RAID series 6 and 7 offer throughputs of 6GB/s, PCIe 2.0, popular models being H700 and H800, supporting up to 1GB of cache. Series 8 and 9 push up to 12GB/s, PCIe 3.0, and up to 1GB cache, with the H710 and H810 models. Whether you are looking for fast spares, or upgrading, check online for the latest prices for refurbished Dell PERC controllers.